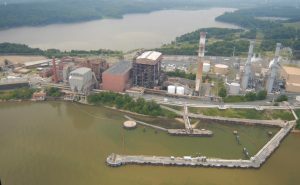 The move by Dominion Energy to consolidate and then drain the water from a large pond containing coal ash at the Possum Point generating facility along the tidal Potomac River has been in the news and generated controversy. This page provides a short look at how these wastes are being generated and stored in the Potomac basin. Coal ash ponds provide on-site storage for the captured waste products from generation, sometimes called coal combustion byproducts (CCB) at a power plant. The Possum Point ponds store years of waste produced when the plant burned coal. The plant converted to using natural gas and oil in 2003. Ruptures of coal ash ponds at sites elsewhere in the U.S. prompted EPA to reexamine the storage and use of CCB, resulting in new rules issued in 2015. Dominion Energy, which operates Possum Point, complied with the rule with a project that would dewater and combine the waste into one large pond, which would then be capped. Why is coal ash regulated? Coal ash can contain many constituents, including arsenic, selenium, mercury, boron, thallium, cadmium, chlorides, bromine, magnesium, chromium, copper, nickel, and other metals. Without proper management, these contaminants can pollute waterways, ground water, drinking water, and the air. In 2008, a large coal ash spill at the Tennessee Valley Authority (TVA) power plant in Kingston, Tenn., flooded more than 300 acres of land and released coal ash into the Emory and Clinch rivers. This catastrophic spill prompted EPA to reassess coal ash surface impoundments and gather information from facilities managing coal ash nationwide. By setting these regulations, EPA has set standards that it feels protects the environment. The regulations address concerns that include possible leaking of contaminants into ground water, blowing of contaminants into the air as dust, the catastrophic failure of coal ash ponds and methods for closing them. This final rule also supports the responsible recycling of CCBs by distinguishing safe, beneficial use from disposal. In its ruling, EPA decided that CCB is not a hazardous waste. The CCB commonly contains arsenic, mercury, lead, and other substances. Environmental stewardship groups and the State of Maryland have raised concerns that the permitted levels of these substances that will be released into the Potomac River might harm the Potomac River ecosystem, including newly hatched fish during spawning season. Coal as a source of fuel for electric generation is declining and no energy corporation currently has plans to build a coalfired plant. Many former coal plants have been closed or reconfigured to burn gas or oil, which produces much less waste, although their CCB legacy remains in landfills and mine reclamation sites. AES Warrior Run, Md. 205 Megawatts coal AES Corp.
Maryland has the most readily available information about CCB storage and use because the state code requires annual reporting on CCB status. The Maryland Code was amended in 2008 after dozens of private wells (outside the Potomac basin) were contaminated by ash dumped in an unlined gravel pit. The new EPA rules will bring other states closer to Maryland’s rules. Power plants in Maryland generated 1.5 million tons of CCB in 2013. Approximately 87 percent (1.305 million tons) is used in the production of wallboard, concrete, and other products. The rest is landfilled or used to fill abandoned coal mines. Morgantown CCB is sent to several landfills in Charles County, Md., most at the Faulkner fly ash facility, which holds an estimated 7 million cubic yards. The site is active, and is a fully lined landfill with ground and surface water monitoring. Dickerson CCB is stored at a lined landfill in Montgomery County, Md., near the plant. It holds about 3.5 million cubic yards. The lined facility includes ground and surface water monitoring. AES Warrior Run is a fluidized bed coal facility, which reduces many pollutants but produces highly alkaline waste. It produces about 415,000 tons of CCB, which is used as fill at four nearby surface coal mines in Garrett County, Md. The Mt. Storm plant in West Virginia produces about 1.144 million wet tons of CCB. The waste is sent to a pond on-site and to landfills and mine reclamation projects in West Virginia and Maryland. About 10 coal mines in Allegany and Garrett counties, Md., are accepting coal ash. The AES facility uses these sites. Other mines have been filled and are now inactive. In Prince George’s County, Md., a landfill stores CCB from the Chalk Point generating plant, which is outside of the basin. It holds an estimated seven million cubic yards. For the Possum Point facility, the legacy coal ash ponds have been combined into a single pond that is being dewatered and eventually will be capped. The pond is not lined. Two major ash landfills in Maryland’s portion of the basin have leaked toxic chemicals. Both of these sites predate the landfill regulations adopted by Maryland in 2008. The sites have increased groundwater levels of cadmium, arsenic, and other chemicals. They are still active landfill sites and are being monitored. Groundwater and land is being monitored around coal mines where CCB is being disposed. At Possum Point, the drainage of the final pond site (about 150 million gallons of treated water) is underway. The plan (approved by Virginia DEQ and EPA) to cap the drained pond is being challenged in court. Dominion has stated that it will treat and monitor to a higher degree than the permit requires after discussion among the company, environmental groups, and municipal officials. Some parties want the ash removed to a lined landfill further from the river. In the U.S. (2012), about 131 million tons of CCB were created, with about 43 percent being used in production of wallboard and concrete. The remaining 75 million tons were disposed of. That total will likely decrease over time because of declining use of coal for power production. The basin states must at least meet federal standards in their rules regulating coal ash, available below.